The oldest and most prestigious school of Islamic jurisprudence is Al Azhar University, founded in Egypt in approximately 970 AD. 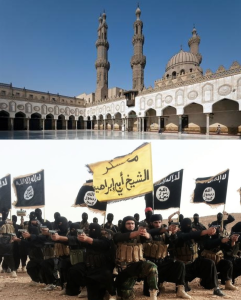 Al Azhar and its leadership continue to affirm “Jihad,” which it defines as war-fighting against unbelievers (non-Muslims), is obligatory until the world is under Islamic rule. Oddly enough, this is exactly what Al Qaeda, ISIS, the Muslim Brotherhood, and all of the other jihadi organizations in the world teach, and what is taught in Islamic elementary schools around the world, including the United States. For a sneak peak of the upcoming UTT video series from Episode I dealing with this issue, click HERE. It would be hard to imagine any better way for what has become a contextual population of comatose sleepwalkers to finally grasp the lethal danger they and their loved ones potentially face at the hands of sharia-adherent Islamists whose birthrate reputedly triples every two decades, and who are flooding, un-vetted, into the country in droves, than having access to a pre-advertised contextual UTT video series, for the production of which the American people, particularly given the unique expertise said product reflects, should be eternally grateful.